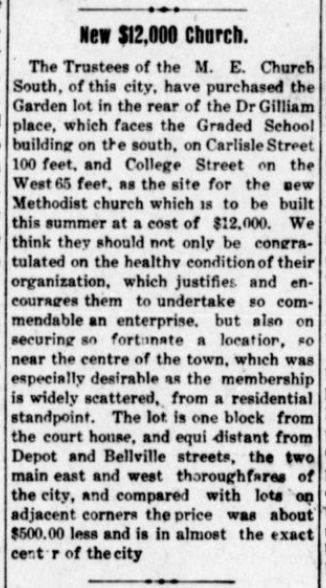 The Trustees of the M. E. Church South, of this city, have purchased the Garden lot in the rear of the Dr Gilliam place, which faces the Graded School building on the south, on Carlisle Street 100 feet, and College Street on the West 65 feet, as the site for the new Methodist church which is to be built this summer at a cost of $12,000. We think they should not only be congratulated on the healthy condition of their organization, which justifies and encourages them to undertake so commendable an enterprise, but also on securing so fortunate a location, so near the centre of the town, which was especially desirable as the membership is widely scattered, from a residential standpoint. The lot is one block from the court house, and equi distant from Depot and Bellville streets, the two main east and west thoroughfares of the city, and compared with lots on adjacent corners the price was about $500.00 less and is in almost the exact center of the city. Source: Crittenden Record-Press. (Marion, Ky.) 1909-191?, June 3, 1909, Image 1 - Chronicling America - The Library of Congress.